Multiple sclerosis is a disease of the central nervous system (CNS) in which the normal conduction of nerve impulses is interrupted due to loss or damage to the myelin insulation covering nerve fibers. In the CNS, the myelin sheath is a membranous extension of specialized cells called oligodendrocytes. These membranous extensions form an insulating substance that covers nerve fibers in the white matter of the brain and spinal cord. The velocity or speed of impulse transmission through nerves depends on whether or not the axon is covered by myelin. Non-myelinated axons conduct impulses very slowly. Healthy myelinate nerves can conduct impulses 50 times faster than non-myelinated nerves. MS causes axons to lose their covering of myelin, a process known as demyelination. Demyelination disables axons, making them unable to conduct stimuli rapidly or effectively. 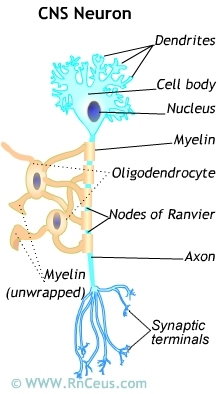 Axons not covered by myelin transmit nerve impulses more rapidly than myelinated axons. The etiology of multiple sclerosis (MS) remains unknown. Currently, MS is presumed to be an immune-mediated inflammatory demyelinating disease of the CNS, that is triggered in susceptible individuals by an unidentified environmental agent. effective drug treatments have been immune modifying medications. The "viral theory" involves an initial viral infection, perhaps occurring in early childhood. That infection causes the immune system to produce leukocytes which are able to recognize and destroy the virus. It is believed that the initial infection damages the endothelial lining of vasculature serving the CNS. Damaged vessels allow leukocytes to cross the blood brain barrier. After gaining entry to the CNS these sensitized leukocytes mistakenly react with the myelin sheath of CNS neurons. When the leukocytes react to the myelin sheath, they release proinflammatory chemicals such as: such as interleukin-2 (IL-2), interferon-gamma (IFN-g), tumor necrosis factor-alpha (TNF-a), and interleukin-1 (IL-1). These chemicals damage or destroy oligodendrocytes, the myelin sheaths they produce and the underlying neural axon. Inflammatory damage to the myelin sheath produces lesions known as plaques. MS plaques range in size from a few millimeters to many centimeters and are found scattered throughout the white matter of the CNS, particularly in the optic nerves, the brainstem, the cerebellum, the cerebrum, and the cervical spinal cord. The plagues are formed by leukocyte infiltration and glial cell activity that result in inflammation, demyelination, scar formation and axon damage. The term "multiple sclerosis" describes the multiple areas of scarring (plaques) in the brain and spinal cord that occur due to inflammatory damage. Scarred areas along the myelin sheath interrupt the transmission of nerve impulses, producing the symptoms experienced by people with MS. The myelin sheath surrounding the white matter in the peripheral nervous system is the site of damage in MS. The susceptibility model theorizes that MS is the result of a an abnormal immune response mediated by an individuals genetics. A specific cluster of human leukocyte antigens, expressed on the surface of cells, is found in significantly greater numbers in MS patients. Theoretically, this "susceptibility" predisposes the individual to manifest MS long after exposure to an external or environmental factor, such as a virus. A genetic predisposition may also make an individual more susceptible to whatever triggering factor initiates the expression of genes which leads to the development of MS. Recent research has isolated abnormal autoreactive T-cells from an MS patient. These T-cells have an altered receptor which may allow them to escape destruction by the thymus. Normally the thymus destroys T-cells that react to self. It is possible that these aberrant T-cells cross the blood brain barrier to begin the cascade of immune events that result in MS. So far the aberrant T-cells have been isolated in only one patient. However, their existence offers researchers another pathway to explore the etiology of MS. Patients with MS have a higher number of specific human leukocyte antigens on the surface of the cells. An increase in the prevalence of MS over the last decade has been attributed to increased longevity of the population, improved reporting, consistent diagnostic criteria, and technological advances such as magnetic resonance imaging (MRI).